This Zen temple is located in the south east of Kyoto and is best known for its stunning Fall colors. Founded as long ago as 1236, the Tofuku-ji Temple is one of the five great temples of Kyoto and was established by the powerful Fujiwara clan. Throughout its history, it has been one of Kyoto’s main Zen temples and its gate is the oldest Sanmon in the country. Every Fall, people from across Japan and all over the world come here to admire the stunning colors, with the most famous view being the vista of the Tsutenkyo Bridge which spans a beautiful valley filled with maple trees. Visitors crowd the covered walkway across the 100m long bridge to photograph the panoramic views during mid-late November. Entrance to the majority of the grounds is free of charge, however it is worth paying the entrance fee to visit the Hojo which was the living quarters of the temple’s head priest and its unique surrounding Rock gardens as well as the Tsutenkyo Bridge and the Kaisando Hall – the mausoleum dedicated to the first head priest of the temple. 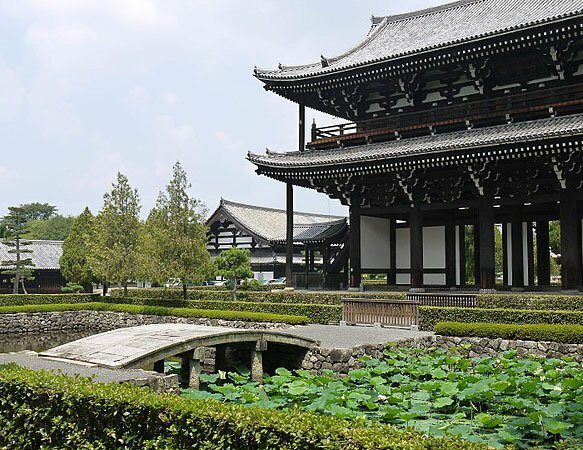 Open all year round, the Tofuku-ji Temple is a must-visit sight for every tourist.